Pretty much any lens is OK at 1000 pixels wide. I don't think I have one which isn't. Reversing any modest kit lens I've tried, works OK. Some might even be comparable with expensive lenses. ("Morfa" found an old 120mm plus a Raynox was comparable with an MP-E65). So the point was, that one can't say very much at all from a few shots shown 1000 wide, certainly not enough to particularly recommend one over another. 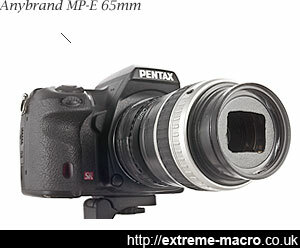 EG for web use, at 2:1 I wouldn't bother other using an MP-E65, I'd just use some ordinary macro lens at 1:1 and blow the middle up. It would still be 2600 or so wide, making it pixel sharp once reduced to 1000. I can tell the difference between my lenses at 1000 pixels wide. That is why I have invested in first Leitz Elmarit and then Kiron, abandoning my Tamron SP 90mm macro. By coincidence, I have recently obtained the 12cm Summar used by 'Morfa'and, using it as a prime macro on extension, I am very encouraged by its performance, running out of season and insects before I shot many images with it. No, sorry, not all zooms work. I've recommended this one because it's a proven buyable specific zoom for people who want to give it a try, cheap to buy, easy to source, and scored best on the criteria I chose. With this config, there isn't an issue traversing the full zoom range when reverse mounted, nor does it vignette, it gives a reasonable magnification variation etc. I have absolutely no doubt that other zoom lenses reverse mounted would work too but I'm afraid you do have to watch out for other factors ie zoom 'traversability' (ie push pull just doesn't work at all reversed), vignetting on different focal lengths and empty lens length variants, and optical quality. The latter is something to do with difference in entrance and exit pupil I _think_, it seems to work better reversed where they're a similar size. But of course it could be something else, so if people want report failures and successes that'd be very helpful. I had 4 that gave me a bit of a problem... Old Cosina 28-80 difficult to use because of the zoom mechanism, Tamron Adaptall 2 I couldn't make work because you can't zoom 50 to 28 with it reversed (great shame, good lens), similar sad problem with Vivitar 28-70, Pentax-A 28-80 does work but you have to tape the focus ring fixed to the barrel and I had to disassemble it partially (to give better working distance). Latter works almost as well as the one I finally settled on but that had the better zoom aspect reversed.